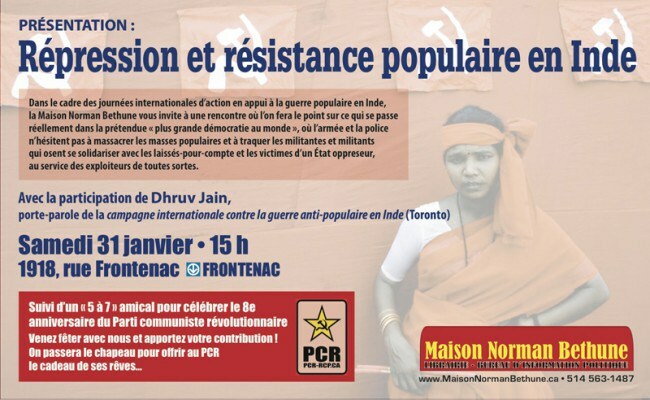 As part of the international days of action to support the People’s War in India, the Norman Bethune House invites you to a meeting where we will report on what is really happening in the supposed “greatest democracy in the world” where the army and the police did not hesitate to massacre the masses and hunt down activists who dare to show solidarity with the have-account and victims of oppressor State, serving any kind of exploiters. 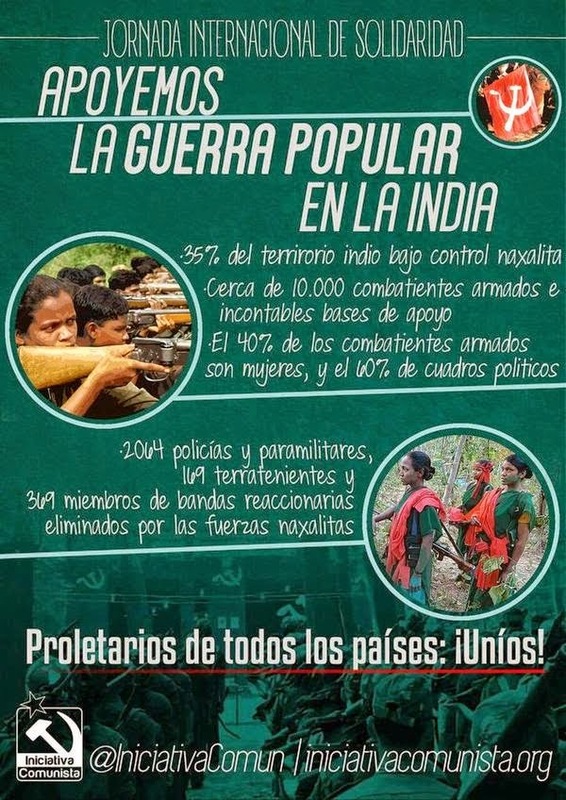 The Comité Galego de Apoio a Guerra Popular Na India launched a campaign of propaganda for the International Day called By ICSPWI. 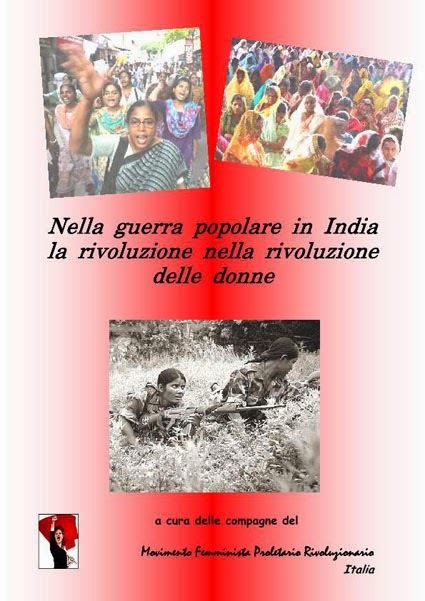 We have decide to publish this poster at solidarity days to popularize and give support to the heroic protracted people’s war in India waged by Indian proletariat under the leadership of CPI(Maoist). Indian Struggle is our Struggle! Its victory is our victory! its defeat is our defeat! Long Live Marxism Leninism Maoism! 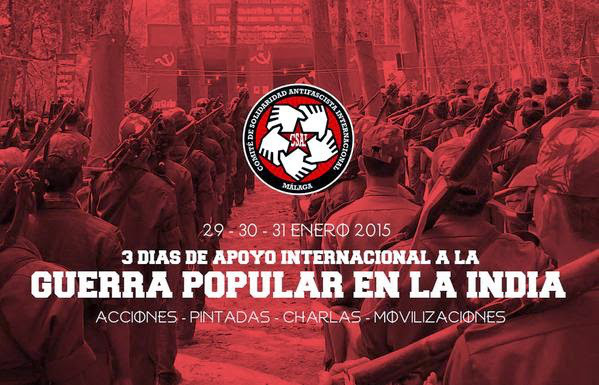 Support to the Protracted People’s war! 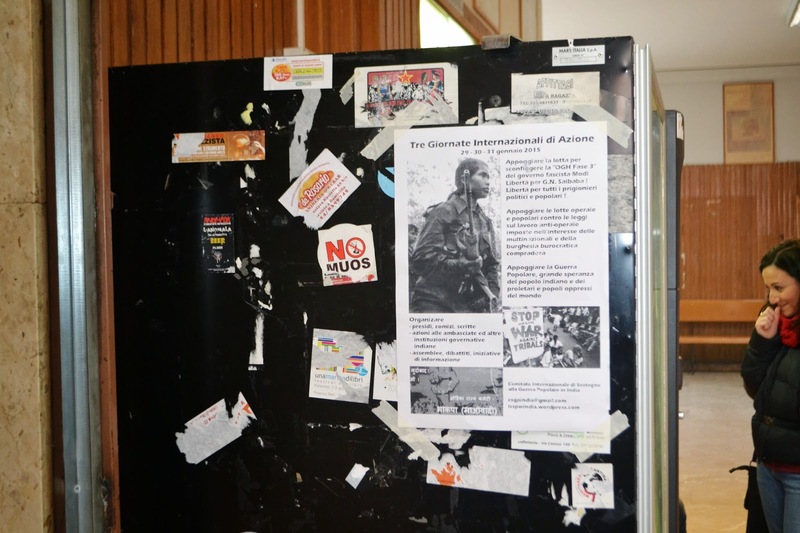 Also we will give our support by spreading publications and statements of CPI(Maoist) among revolutionary peoples. Best Succes to days of action 29-30-31january for PW in india! Long Live PW in India! The office of the National Highways Authority of India (NHAI) at Kalamassery here was vandalised on Thursday by unidentified miscreants claiming affiliation to the Communist Party of India (Maoist). 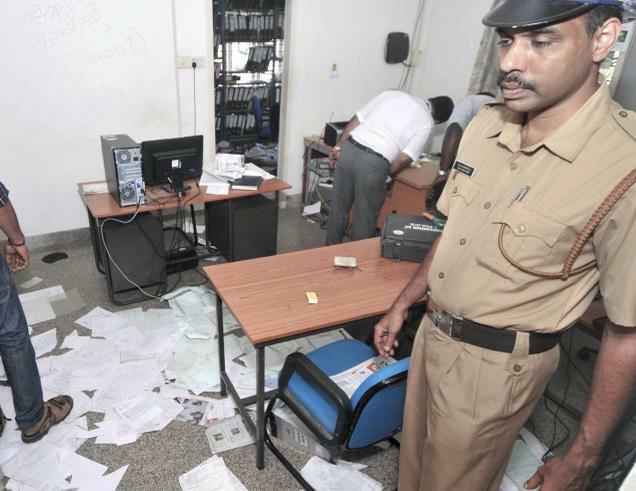 In an attack similar to that at the office of Nitta Gelatin India Ltd. at Panampilly Nagar November last, the vandals pulled files out of the shelves at the NHAI office onto the floor and set fire to a few of them. The incident occurred between 8.30 a.m. and 9.15 a.m.. The attack occurred on a day that Maoist groups in the State had declared to be ‘action day’ to take action against organisations that allegedly committed injustice. 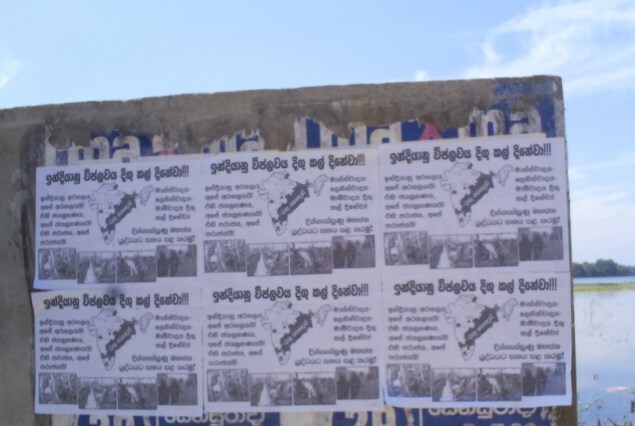 The attackers left pamphlets protesting against the acquisition of land for National Highway expansion and privatisation of the agency’s works. 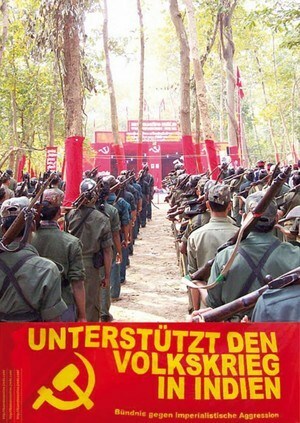 The pamphlets claimed that the attack was carried out by the CPI (Maoist). 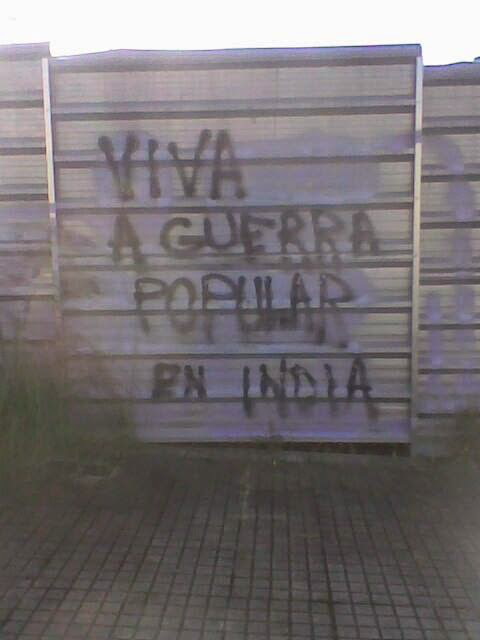 ‘CPI (Maoist)’ was also scrawled in black letters on the walls of the office. KOCHI: The second attack by suspected Maoists in the city has put the City Police in a fix, who are still groping in the dark with regard to the probe into the Nitta Gelatin attack in November last year. Moreover, it shows the incapability of the police in acting on Intelligence warnings of possible attacks on Thursday, Friday and Saturday, which are said to be ‘Maoist action days’ in the State. Even IG M R Ajithkumar and City Police Commissioner K G James mentioned about it while addressing mediapersons after the attack on the office of the National Highway Authorities of India (NHAI)on Thursday. The corporate office of Nitta Gelatin India Limited (NGIL) at Panampilly Nagar was attacked on November 10 by a nine-member gang claiming to be CPI-Maoists. The City Police have managed to nab only two suspects in the case; that also after being alerted by the Palakkad Police who arrested the men in connection with the attack on two multi-national food chains at Chandranagar in Palakkad district. The remaining seven persons are still at large, though the police are having the CCTV footage of the incident. So, Thursday’s attack reveals that the police investigation has reached a deadlock in all respects. James further pointed out that Arun Balan and Srikanth Prabhkaran, who were arrested from Palakkad district in connection with the previous attacks, were adamant and hardly disclosed any detail during interrogation. Special Branch Assistant Commissioner A D Balasubramanian, who shared the views of James, stated that the police had never failed to act on Intelligence information. “The incident occurred in a remote area along the national highway where there is hardly any police patrolling. We are fully equipped to curb such incidents. Moreover, when the attack was launched, the National Highway Authorities of India employees thought it was just a fire accident and failed to inform the police in time,” he added. 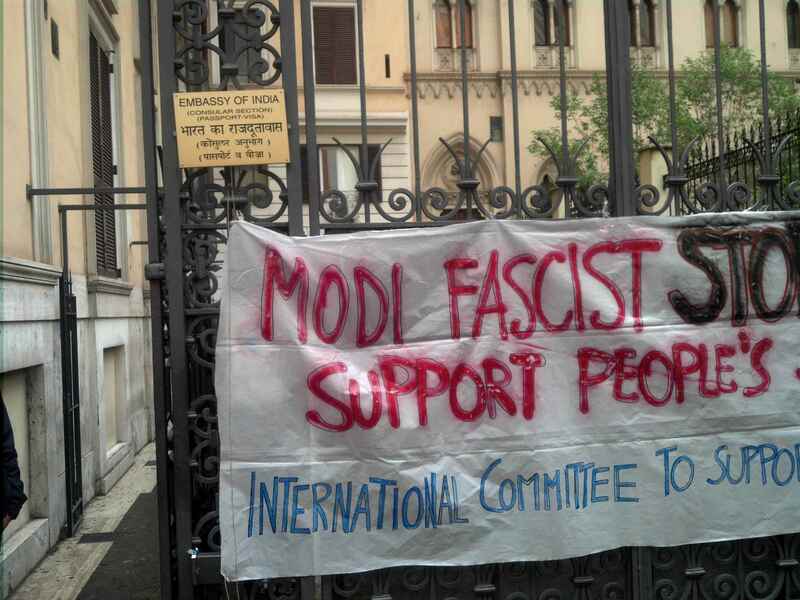 From India to Italy only the people’s war can free fro Imperialism/capitalism that oppress and exploit. According to the City Police Commissioner, the police neither ignored any Intelligence report nor did it show any apathy in probing cases. Ever since we received information about the ‘Maoist action days’ from the Intelligence, the police have been keeping vigil and conducting combing operations. But unfortunately, the attackers chose an isolated place, where police patrolling is weak. We have taken every step to book the perpetrators of the attack,” said K G James. 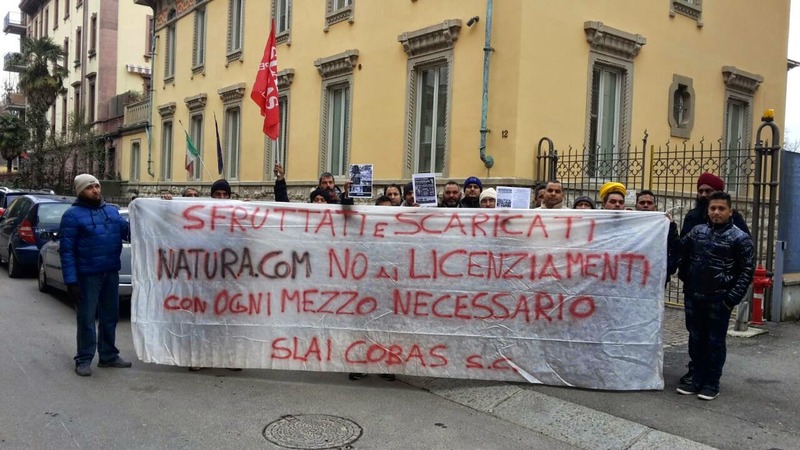 The workers of natura.com, all from India, are struggling against the firings. This morning, during a protest in front of the Job Office, they reverberated the message of hope of the struggle of workers and peole of India. 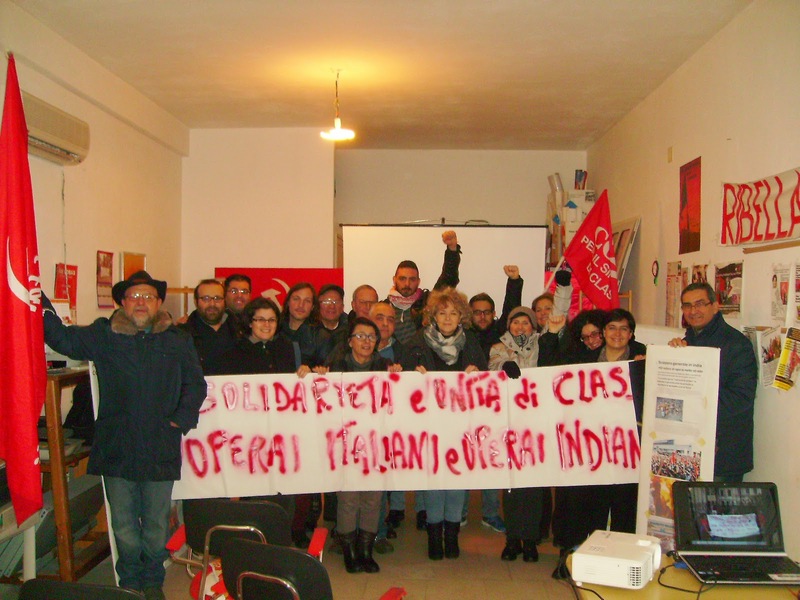 They said that “from India to Italy the masters are united in the attack on workers bymeans their governments, Modi as Renzi, the Jobs Act in Italy as the reform of labour Laws in India” … “The struggle of the Suzuki workers is not only a struggle for better conditions of work but questioned the issue of the command in the factory, at the centre of which there is the exploitation of workers for profits, the basis of the whole capitalist system. 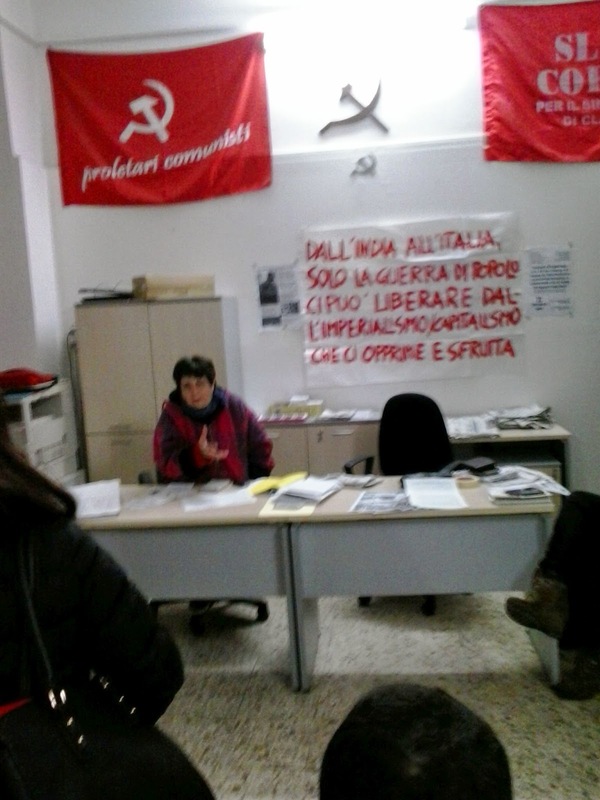 Workers are an international class and represent the only force that can tranform the world, so they have the same goal: to put an end to the system of bourgeoisie”. 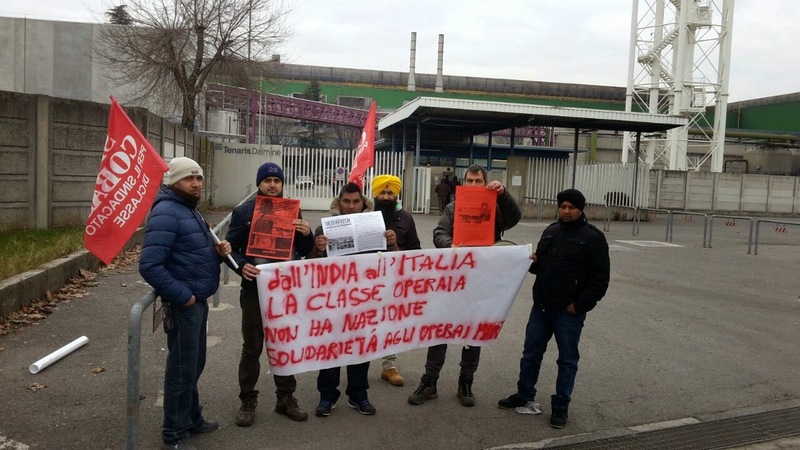 At the shift change, a delegation of Indian Natura.com workers took part at a speech to the workers of Tenaris Steel in Dalmine. 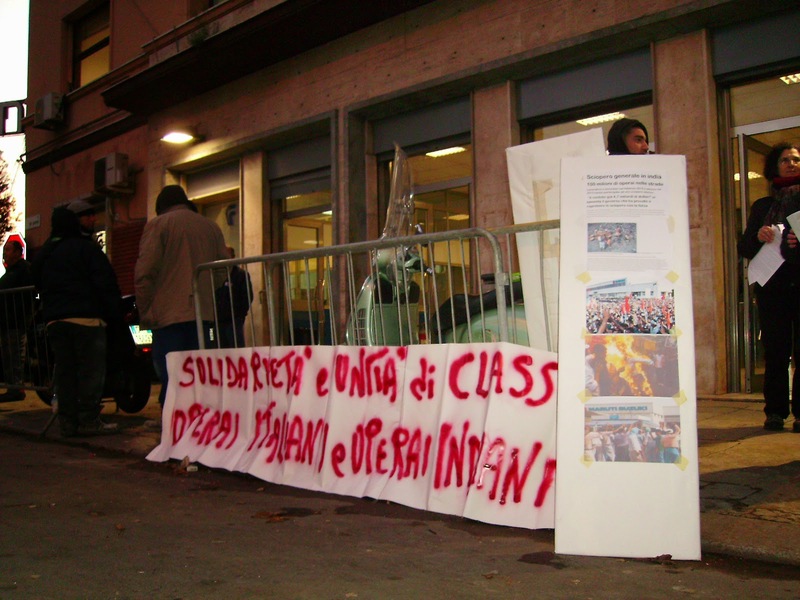 From the statement adoptedby Italian workers: “The struggle for the rights of workers and people, for a job, better conditions of work, freedom, democracy, to topple the power of masters for a power in the hands of workers and people is an international struggle that unites us. Counter-information against Operation Green Hunt. 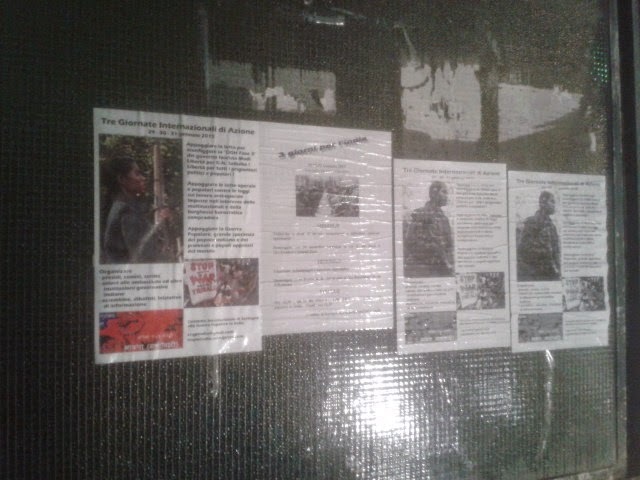 The support to the people’s war, in the context of the aggression of imperislim on people of the world under the fake banner of the “struggle against trerrorism”. Pamphlets asking locals to boycott Republic Day celebration in Madhya Pradesh’s Balaghat district were recovered with police sounding high alert in the naxal-hit district, bordering Chhattisgarh and Maharashtra. 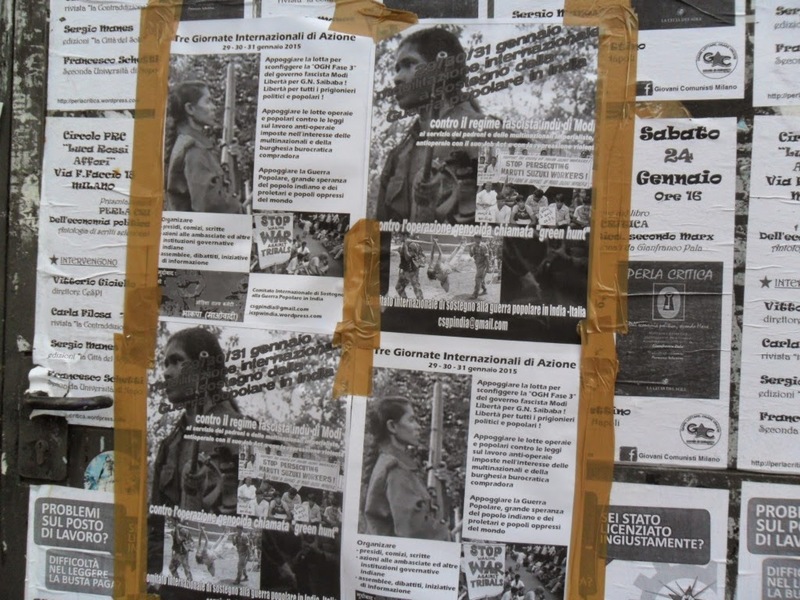 Police said the pamphlets were allegedly circulated by rebels under the name of ‘Tada Dalam’ and pasted on walls in rural areas of Devarbeli, Songudda and Machhurda, under Roopjhar police station limits of the district. “The pamphlets urged people to shun Republic Day celebrations and criticised the government, stating it was exploiting tribals and encouraging illegal mining and crone capitalism,” Superintendent of Police, Gaurav Tiwari, told PTI today. 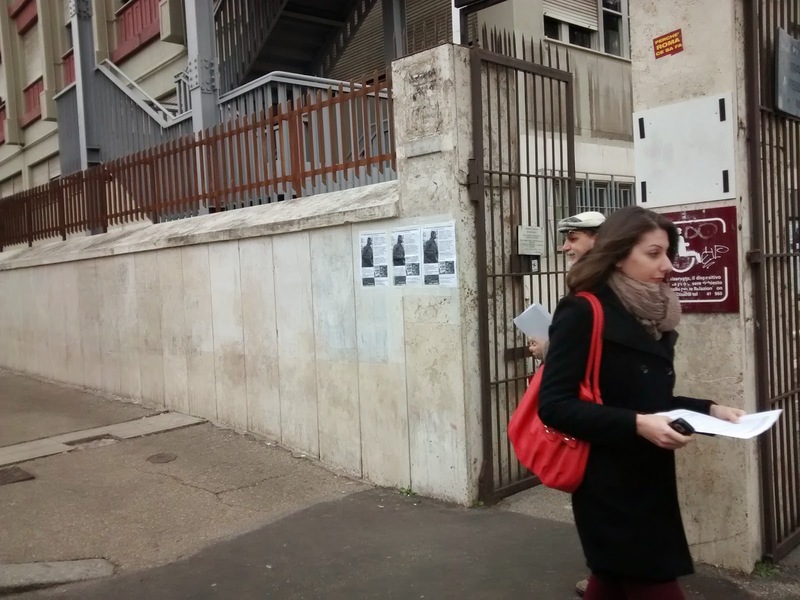 The SP said the handbills were recovered yesterday, following which police has sounded red alert last night. Tiwari said they were investigating whether the pamphlets were pasted by naxals or some other persons to create panic. He said that security has been stepped up in naxal- affected areas in the district and joint search operation of MP police with Chhattisgarh and Maharashtra counterparts has been launched. CRPF personnel too have increased their vigil, he added. In the first phase of panchayat polls, held recently, naxals had given a call to villagers to represent a common candidate to win the elections unopposed, but, locals did not accept it. A project office of National Highway Authority of India in Kochi was attacked allegedly by Maoists on Thursday morning. 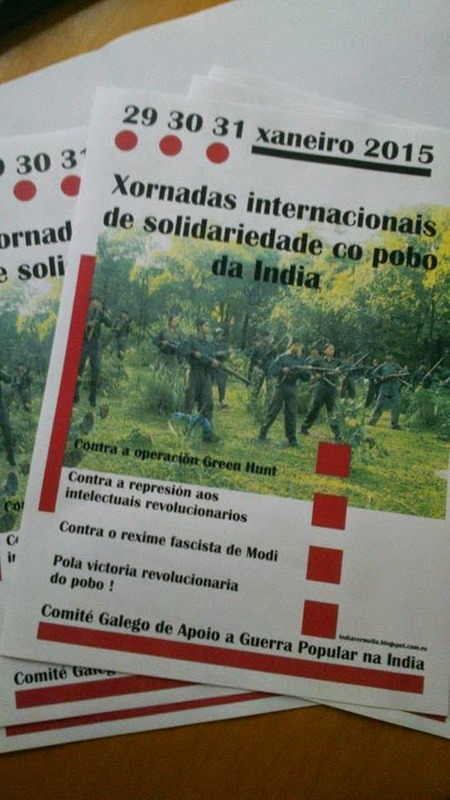 Police have recovered pro-Maoist literature from the office premises. According to police, the incident was reported around 9 am after the sweeper left the office. The unidentified assailants had burned office files. The incident came to light only when office staff reported for duty in the day. Some of the pamphlets recovered from the office premises have slogans in protest against development of the highways under BOT scheme. Kochi range IG Ajith Kumar said police have been conducting a combing operation in the city based on intelligence report that Maoists may attack some offices in the city. However, we could not cover all offices, he said. In Kerala, the opposition against NH development under BOT scheme was spearheaded by fringe Muslim and ultra Left outfits. Although mainstream parties have supported widening of the highways into 45-meter width, the government could not go ahead with land acquisition mainly due to the protest from local people and traders. MANANTHAVADY: The armed group which had ransacked Tamarind Easy Hotel run by the Kerala Tourism Development Corporation (KTDC) in Thirunelli the other day, reportedly visited a couple of houses in the vicinity after attacking the resort. 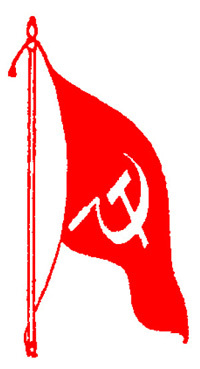 According to Sukumarannunni Warrier, a resident of Thirunelli, the gun-wielding persons visited his house around 5 am on January 25 and handed over copies of pro-Maoist newsletters and ‘Kattuthee,’ the mouthpiece of ‘Kabanidalam’, the Communist Party of India (Maoist) wing operating in the Western Ghats region. One of the group members introduced himself to Warrier as Roopesh alias Praveen. The extremists reportedly told him that they would strongly oppose the ‘resort culture’ in the area as it was being done at the expense of poor farmers and tribal people. Roopesh, who was accused of coordinating the activities of the banned outfit in the state, is in the list of ‘wanted Maoists’ in the state. The gang also visited the residence of Muraleedharan, the owner of a building under construction in the area. The group, comprising four men and two women, were reportedly wearing uniforms similar to those of security forces. Police officials, however, refused to confirm the reports. Meanwhile, the Thunderbolts and the anti-Naxal squad have intensified their search for the gang in the Thirunelli forests under the Begur Forest Range of the North Wayanad Forest Division. The attack on Tamarind followed the late-night attack on ‘Agraharam,’ a private resort in Thirunelli in the early hours of November 18.